Three mounting options in one piece of hardware! 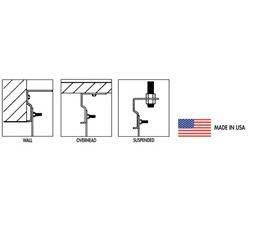 Mount to overhead surface (inside-doorway), wall or suspend with threaded rod (not included). Order by linear foot to the same width as your opening. 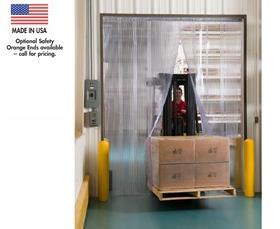 (Up to 8' can ship UPS). Other amounts available, call for quote. All hardware is galvanized and comes with 3 snap caps per foot. Significantly reduces heat from sun while allowing light into work areas. 65% shade factor -- helps keep facility cooler longer. Improves ventilation -- allows fresh air in. Productivity increases with employee comfort. Increases security by deterring trespassing, theft and vandalism. Improves building appearance. All seams are double lock stitched using mildew/rot resistant thread - all edges are completely finished. 100% woven vinyl coated, polyester mesh. 11 oz. (per square yard weight). 17 x 11 scrim (17 vertical &amp; 11 horizontal threads per inch). Very strong, high tensile strength. Tear, rot, UV and mildew resistant. Maintain toggle switch control included on Motorized door. Header mounting included on all doors. Available in Gray, Black, Blue, Green,&nbsp;Red, Yellow&nbsp;or Almond -- please specify when ordering. Not a recommended door where wind load or pressure differential exists. See Drawtite Doors for those applications. 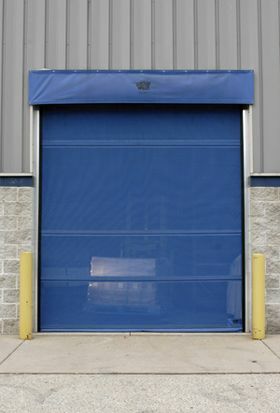 FOB Shipping Point.<BR><BR><STRONG>Outside Stand-Off Mounting.</STRONG> For Motorized or Spring Assist only -- please contact dealer for pricing.<BR><STRONG><BR><U>Common Features of Motorized/Spring Assist Doors<BR></U></STRONG><BR><STRONG>Breakaway Feature</STRONG>&nbsp; <BR>Prevents damage to door or guide track. Easy to reset back into the track.<BR><BR><STRONG>Motorized Door Track</STRONG><BR>EPDM seals on both sides ensure a tight seal at vertical edges.<BR><BR><STRONG>Extrusion N-Roller</STRONG><BR>Custom extruded track with reinforced section. Rollers are trapped in an extruded cavity. Heavy duty rollers provide smooth operation motion. 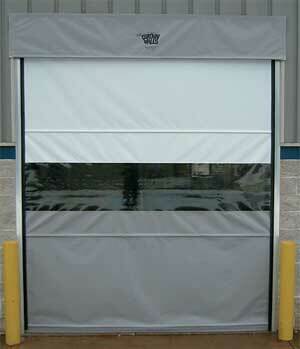 Goff's Harshguard Door is made of all non-corrosive stainless steel parts. 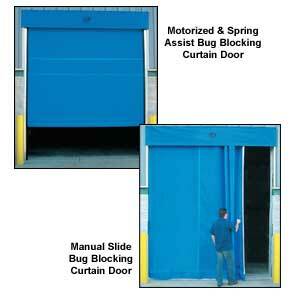 These doors can be used anywhere chemicals, water, and dust could be a problem. The door withstands caustic and corrosive chemicals and moisture buildup. The 18"/sec. motor is water and dust tight. The motor mounts directly to the drive tube assembly with no additional wall mount required. 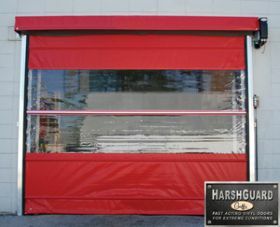 Harshguard Doors are wind load rated. Unique photo optic safety edge reverses the door if an obstruction is present. Perfect for car washes, wash bays, food processing and bottling plants. FOB Shipping Point. Sturdy and dependable security gates are built to LAST! Suggests to potential intruders that system includes other protective devices. Eliminates the cost of guard duty at open doors during working hours. Made of durable 3/4" cold rolled steel channel and riveted back to back with solid steel rivets for maximum strength. Gates over 4' wide roll easily on ball bearing caster on leading edge of gate. 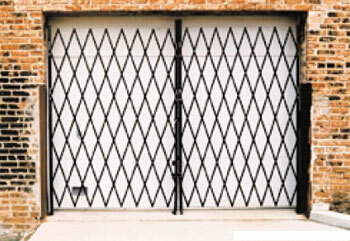 Features include security locking bar on single gates and padlock attachment on double gates. Installs easily with all brackets furnished. Black enamel finish. Special sizes are available -- Please call for pricing. FOB Shipping Point.